Phenology is the science of appearances in nature, slightly blended with legend. It tracks plant and animal development, watching how they are influenced by climate and season, along with observations from people who have worked the ground for generations. Natives of BC use the budding of wild bush berries, to signal the beginning of Halibut fishing. Bird watchers are also avid Phenologists. When certain insects to emerge, hungry flocks are sure to follow. Spring soil temperatures can be hard for us to predict but Nature has a way of knowing these things each year. Watching for signs, can helps us greatly when planting our vegetable and flower gardens. 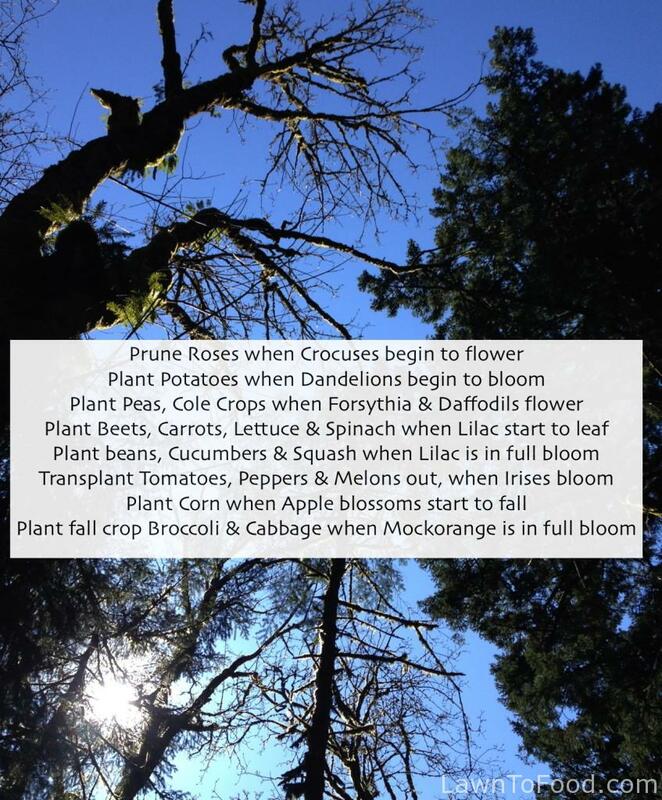 Here are a few suggestions using Phenological Gardening guidelines. Be sure to research the subject for more interesting and informative ideas, specific to your growing climate. This entry was posted in Crop Planning, Growing Food by Lynda. Bookmark the permalink.